I have the day off from work today*. I woke up at 9am, spent over an hour at the gym, showered, ran some errands, picked up lunch, started laundry while eating lunch and when I remove my laundry from the dryer, I am going to go to a coffee shop and do some writing. I also managed to do some social networking/promotion of my book between the gym and getting in the shower. Since I normally have a full-time day job, I usually need to find the time to do all of the above with approximately 9 less hours in the day, but today I did it all without feeling the slightest bit rushed. Having the day off from my day job allows me to pretend to be a full-time writer. I allow my mind to imagine how awesome it would be if I didn’t need the day job. If I won the lottery, married rich, or sold enough books that I could write full time. But I fear I might be dreaming too big, so let’s take a step backwards. Last month, I took half a day off from work on February 14th. It had nothing to do with wanting to spend the morning in bed with my boyfriend on Valentine’s Day (especially since we had broken up a week earlier). No, I took half a day off from work because I was engaged in a cross-promotion of A State of Jane with eight other authors and I knew that I wanted to tweet it, share it, blog it and email anyone and everyone I knew who might be interested in buying my book and those of my comrades at a fraction of the cost. I knew if I went to work that morning, I would be too busy being a trademark paralegal to be a writer. I can’t afford to let my day job suffer as a result of my writing but I also did not want to waste an opportunity to get my book in the hands of people who would rather test the waters of my writing for 99 cents than $2.99 by not promoting the sale to the greatest extent possible. So, I compromised and took the morning off from work. It was fantastic. I woke up early and went to the gym, ran some errands, spent a few hours on various social media sites promoting the sale and got into work at 2pm. Only working in the afternoon allowed my mind to imagine how awesome it would be if I didn’t need a full-time day job. If I won the lottery, married rich or sold enough books that I could afford to work a day job only part time. As of now, I still need my full-time day job and I thank goodness it needs me as well. That being said, I am selling more books than I ever did before. The publication of my 2nd book is definitely driving the sales of my first one and I hope to publish a third one later this year (fingers crossed). So, while I will continue to feel blessed that I have a day job that pays my rent, affords me the ability to have an active social life and take trips when I want, and comes with medical insurance and a 401k plan, I will also continue to hold onto hope that someday…someday, I will sell enough books so I can be a full-time writer and don’t have to “imagine” what it would be like. *This post was actually written last week. I read a tweet today that said, “book writing is much easier than blog post writing.” I responded to the tweet that I agreed and I do wholeheartedly. I didn’t always feel this way. In fact, I was a really good blogger “back in the day.” I used to blog about my dating experiences, my heart breaks, my frustrations with men, friends and family and just life in general. I loved every minute of it and what’s more, I never ran out of material! Then one day, seemingly out of nowhere, I became much less comfortable putting myself so “out there” and I stopped blogging. After I published Just Friends with Benefits, I started blogging again but I tried to keep it “professional.” I blogged about writing and the publication process in general but I kind of hated it. I love to write more than almost anything in the world but I don’t really care for writing about writing. I follow another writer’s blog and she manages to write a new post almost every single day and it astounds me. Never mind the fact that I just don’t have the time for that, I wonder how she comes up with the material! I’m a very open person in general and so I would absolutely love to let you all in on my deepest feelings and I have a lot of deep feelings! For instance, it would be so easy to blog about how I’m dealing with my recent breakup, my reentrance into the single world and new men that might come in (and out…) of my life. But I just don’t think I would be comfortable putting my business out there, especially since my business involves other people too. And I would love to vent about my insecurities about writing and the manic/depressive like symptoms I experience when I go from reading a 5 star review of A State of Jane to a 3 star one and the chronic fear I have of future 1 and 2 star reviews. But since I am trying to be a mature, professional author (cough, cough), that’s not an option either! 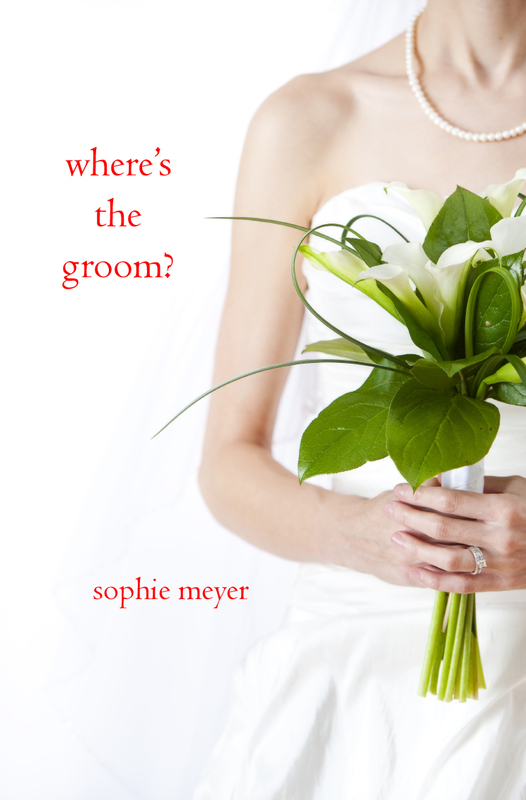 Coming up on my blog, I am hosting an Interview and Giveaway with Sophie Meyer, author of the chicklit novel “Where’s the Groom?” I wish I could give you the heads up on what else is coming down the pike on www.meredithschorr.com but I really have no idea and will have to play that by ear. My intention is to keep this blog a hybrid between topics related to writing/writers/books and pop culture relating thereto and topics relating to me, myself and I (to the extent I feel comfortable). I did promise in my earlier post “Blog Vows” that I would keep it real and not only blog about writing and I will do my very best to honor that vow.